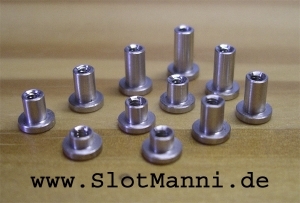 T-screw sleeves made ​​of aluminum, CNC lathe manufactured, made in Germany, female 2 mm outer diameter 3 mm, 5 mm diameter head. 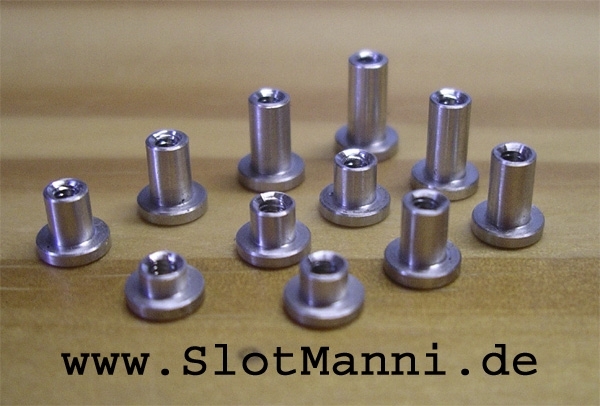 For Schöler, Plafit, Momo and other metal chassis. Caution Do not get a T-tube, for example for Schöler chassis you need just one for the H-beam 4 pieces, 3 pieces for the spring element long, 7 pieces together. with the T-tubes is thus concluded tighten spring over it, onto chassis set up, and ready for Schöler and Plafit chassis. The T-tubes not only facilitate the incorporation of H-beam and spring elements, they also ensure a perfect alignment. Caution when using the original suspension and H-beam, aluminum, make sure that these are carefully trimmed and installed so this is all very leichtgänging, otherwise it may cause scratches on the aluminum tubes. I recommend the use of spring elements, and H-beams made ​​of fiberglass or carbon fiber as in the pictures. This Product was added to our catalogue on Friday 30 December, 2011.